Casseroles are easy to make ahead of time and give you a hot meal on busy weeknights when you don't have time to cook. It's therefore unfortunate that both cooking and not cooking broccoli -- a classic casserole ingredient -- can ruin the final dish. If you're confused about broccoli, fear not. With a little information, you can turn it from a party crasher into a well-behaved guest. 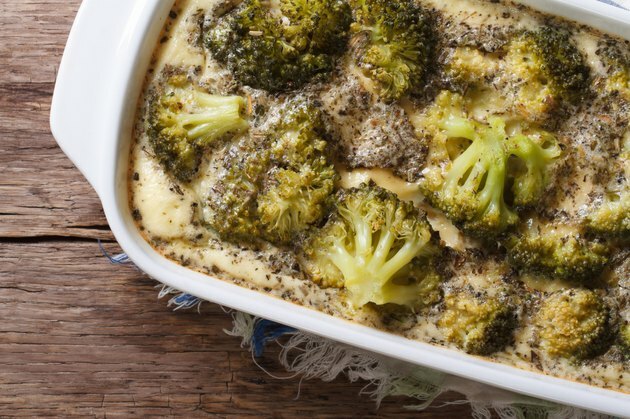 Using raw broccoli in casseroles can cause an unattractive result. As broccoli slowly cooks in the oven, the cell walls break down, allowing chlorophyll -- the naturally-occurring pigment responsible for broccoli's green color -- to escape. That turns the broccoli to an unattractive, dingy brown. Since humans eat with our eyes first, meaning that a food's appearance plays a role in how we perceive its flavor, your family might not like the casserole even if it tastes normal. While using raw broccoli creates an unattractive product, overzealous precooking can also harm the final result. If you precook broccoli by roasting or sauteing, it will turn brown even faster than raw broccoli. And since broccoli contains sulfuric compounds, overcooking -- which dissolves cell walls -- can let those compounds out and make your kitchen smell like rotten eggs. Blanching and shocking -- culinary terms for immersing food in boiling water for a few seconds and then quickly submerging it in ice water -- is the perfect balance between raw and cooked broccoli. According to chef Alton Brown, blanching brings the broccoli's chlorophyll to the surface of the vegetable, while the ice water sets the color, preventing the chlorophyll from escaping. Though blanching and shocking is highly effective, using two kitchen vessels and boiling a whole pot of water is a bit tedious. An easier method, which appeared in the September 2006 issue of "Cook's Illustrated Magazine" is to heat a full tea kettle until it whistles, place the broccoli in a colander, and pour the boiling water over it. That way, you won't have to heat up the kitchen by boiling water on the stove-top. Though the magazine recommends this tip for spinach, it works equally well on broccoli crowns and peeled, diced stems. Is Fresh or Steamed Broccoli Better for Your Health?